Respondents indicated that residual herbicides applied pre-emergence followed by post-emergence application of glyphosate tank-mixed with other herbicides was the most effective weed management option (Figure 2). 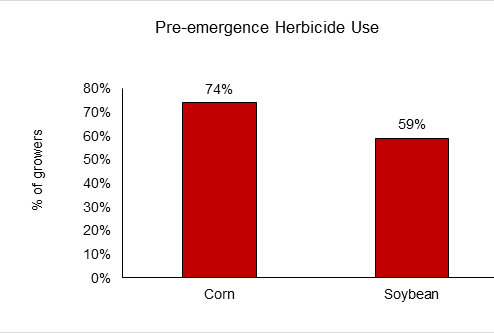 Of the growers, 72% indicated using at least one pre-plant burndown herbicide in the spring. Glyphosate, 2,4-D, and Sharpen (saflufenacil) were the most commonly used pre-plant burndown herbicides listed in the survey.